If you're a frequent traveler, then odds are you're finding yourself in — and keeping touch with people in — different parts of the globe. 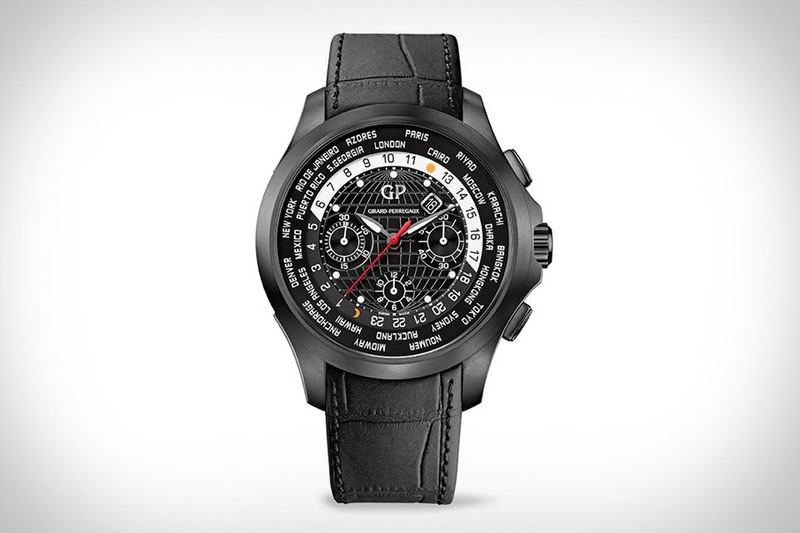 Make it easy to figure out what time it is in whatever part of the world you want with the Girard-Perregaux Traveller WW.TC Titanium DLC Watch. Sporting an understated black titanium 44mm case, this handsome timepiece features an outer ring indicating both the hours and periods of day and night, and a second outer ring with the names cities in all 24 time zones, giving you an at-a-glance look at the time in every part of the globe. A single crown at 3 o'clock, a chronograph function, and a rubber treated alligator textured strap round out this high-end offering. Having a watch that can set itself according to its location is great. So is having a watch with a mechanical movement. With the VCXO One Magic Button Watch, you get both. Powered by an automatic mechanical movement with a 5-day power reserve, this unique timepiece features the aforementioned button on its side at 9 O'clock that activates a GPS module, figuring out the current local time and setting into motion a small motor that sets the time for you. As a result, there's no crown on the other side of the 46mm watch — just a button that winds the movement and gives you more juice. Magic, indeed. The Polomeister© has a well-known love for classic automobiles, so it's no surprise he'd design a watch based on one. The Ralph Lauren Ceramic Automotive Watch was inspired by his 1938 Bugatti 57SC Atlantic Coupe, sporting an outer elm burl wood dial, a matte black ceramic case, a self-winding movement, elapsed time counters, a date display, and a printed tachymeter scale — must haves for the old-school racer. Comes complete with an alligator-embossed box; vintage ride sold separately. While most of the world waits for Apple to announce whatever its new wrist-bound iGadget is called, there are plenty of other people looking to get into the smart watch game. The Withings Activite Smart Watch is a perfect example. Instead of slapping a screen onto a band and calling it a day, the Activite looks like a normal timepiece, with slim watch hands, a stainless steel case, and a sapphire cover. But where it differs from your average watch is in its ability to track your steps, swimming, and running, showing an analog visualization of your progress right on the face while connecting to your phone for more in-depth tracking, sleep monitoring, and automatic watch setting, no matter where you roam. Watches that use GPS to help you on the course are nothing new. Clip-on swing trackers are old news. But a wearable that combines them both? Now you've got something. The Garmin Approach S6 GPS Golf Watch continues the GPS-maker's golfing line with a host of sensors that it uses to track your swing tempo and speed, comparing your tempo against the ideal ratio and giving you audible tones to improve your mechanics. Of course, it's also got serious GPS chops, with detailed, full-color views of over 30,000 courses, the Pin Pointer to help with blind shots to the green, a green view that allows you to move the pin to its current location, and the ability to keep your score and measure your distance on big shots. You've got a tough job that takes you to some pretty harsh environments — and you've built up a collection of gear that can get you through all of it. So why should your watch be any less tough? The Breitling Avenger Blackbird Watch is made to endure just about anything life throws its way, with a lightweight, yet durable titanium case, military-style fabric strap, and water resistance down to 300 meters. With an all-black case, strap, and face, it looks the part in any technical situation, while a self-winding high-frequency movement keeps it running day in and day out. 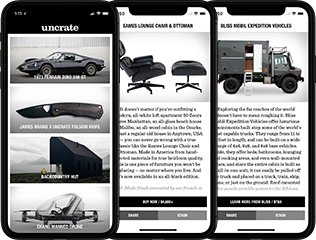 Anytime you hear the world "flagship" attached to a product, whether it's a car, TV, or even a watch, you know you're getting the best of what that company has to offer. The Citizen Eco-Drive Satellite Wave F100 Watch is no different. Designed with globetrotters in mind, it boasts the world's fastest satellite signal reception speed to give you the accurate time in any of 40 different time zones while measuring only 12.4mm thick thanks to a case made with proprietary titanium alloy. In other words, no matter where you go, you'll never have to manually set your watch again.